No matter how hard you try to keep your carpets and upholstery clean its unavoidable because they act as filters catching everything floating around in your home. 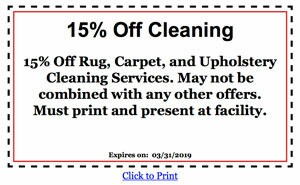 To maintain a healthy and presentable environment, you should clean your carpets and upholstery every year. At Baileys, we have a large 5,000 square foot facility where we take the time and care to clean your area rugs. In this speciality cleaning plant, we flush out all the different types of soiling that have filtered and been trapped in the fibers of the area rug to insure a very thorough cleaning. To achieve the same quality and meticulous cleaning in our wall-to-wall and upholstery services as in our area rug cleaning we use a powerful truck-mounted system. This sophisticated machine has the ability to adjust the vacuum pressure and water saturation. Depending on how soiled, or the type of carpeting we are cleaning, our skilled technician determines the amount of vacuum pressure, moisture, and the cleaning products that will be used. We finish our cleaning process with a special rinse that safely eliminates any excess soap leaving your carpets soft and bright. Over the 70 years that Bailey Rug Company has been serving the Bay Area, we have listened to our customers and have used their feedback to improve our cleaning services and customer satisfaction. Outstanding customer service and communication. Protect and respect your home as we are working in it. Guide you in what products and services you would benefit from and the difference between them so that you can make a comfortable decision and not purchase something you don’t need. Our Technician’s will go over any problem areas before getting started. Low moisture steam cleaning prevents extended dry times. Pre-spray all areas and agitate to loosen up soiling. Fiber rinse to cancel any soap residue ( 90% of carpet cleaners leave too much soap, or over saturate carpeting or upholstery, that has been cleaned). Extra dry strokes from our vacuuming system to dry things as fast as possible. We typically will move as much furniture that we can, unless it will either damage the furniture or the carpeting. We leave you in peace knowing that your home is now clean and ready for another year of activities. At anytime please call us and we will be more than happy to help you with removing your own spots and ways to tackle maintenance in between cleanings! Call us today at (650) 342-1404 for more information or to schedule an appointment. I'm very excited to get it next week. Their prices are fabulous too! They are also some of the nicest people you will meet. Highly recommended!! I've been using Bailey Rug Company for over twenty years.They rock!